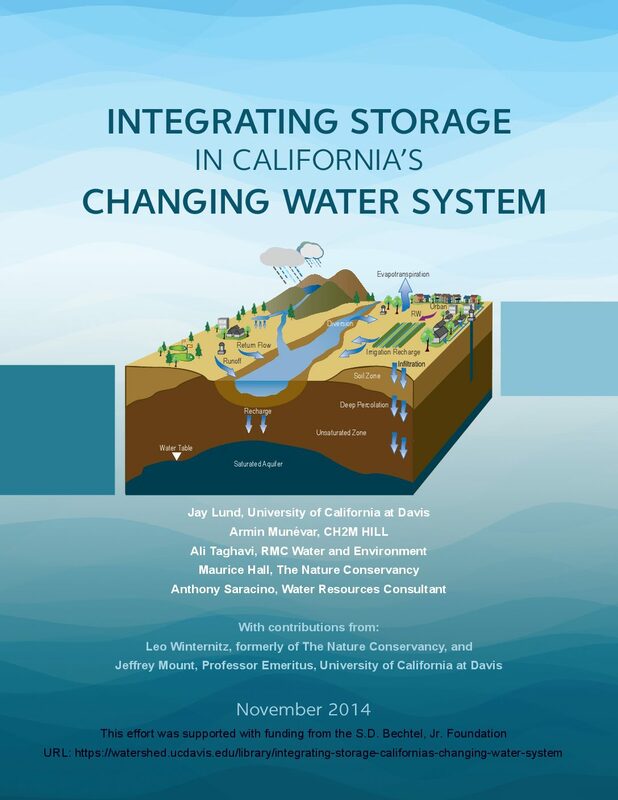 In California, surface water from rainfall, snowmelt, and distant rivers rarely meets the state’s urban and agricultural water needs. 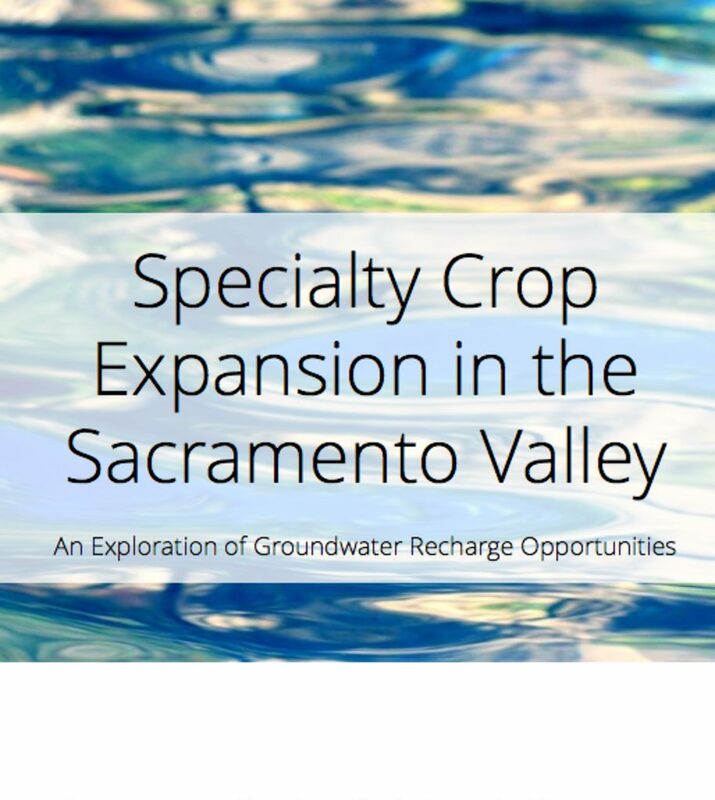 Groundwater is an essential water source, providing 35% of the fresh water used in California. However, when groundwater is used more rapidly than it is naturally replenished, groundwater management becomes necessary. 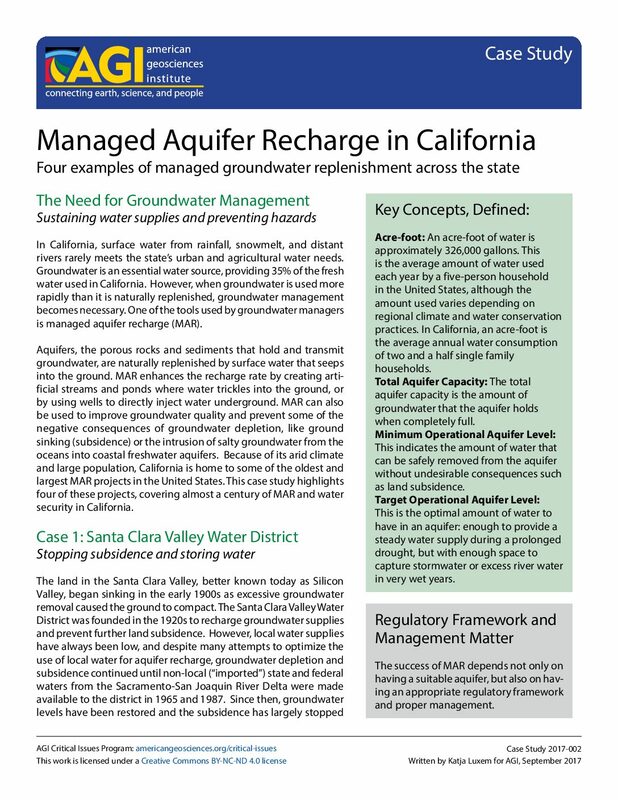 One of the tools used by groundwater managers is managed aquifer recharge (MAR). Aquifers, the porous rocks and sediments that hold and transmit groundwater, are naturally replenished by surface water that seeps into the ground. 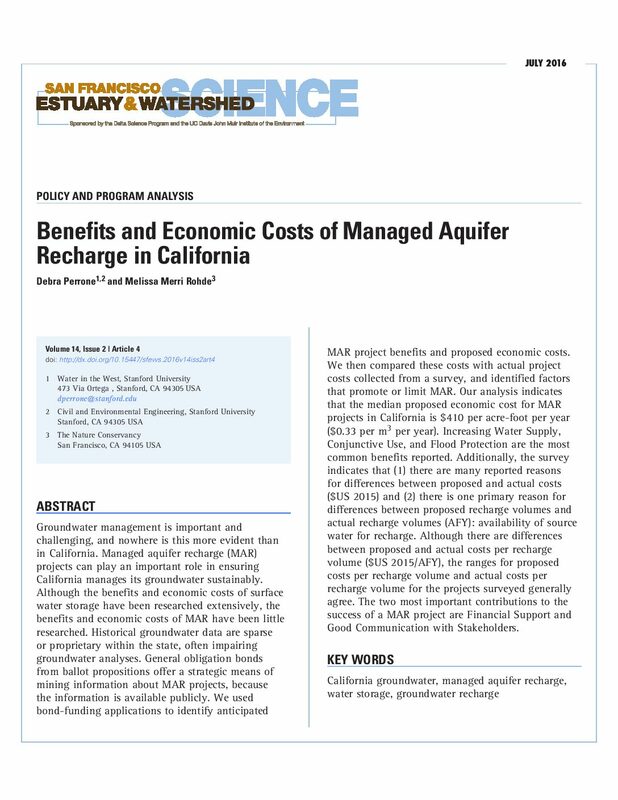 MAR enhances the recharge rate by creating artificial streams and ponds where water trickles into the ground, or by using wells to directly inject water underground. 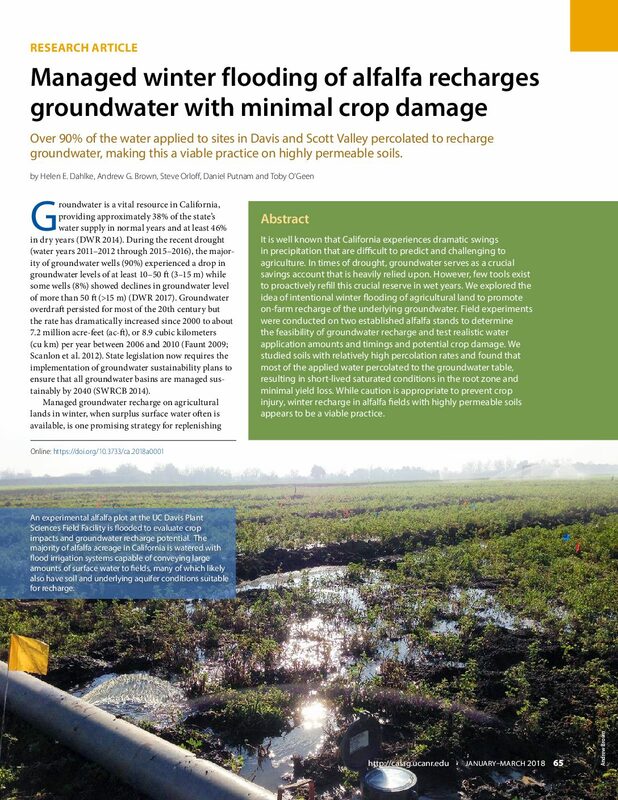 MAR can also be used to improve groundwater quality and prevent some of the negative consequences of groundwater depletion, like ground sinking (subsidence) or the intrusion of salty groundwater from the oceans into coastal freshwater aquifers. Because of its arid climate and large population, California is home to some of the oldest and largest MAR projects in the United States. 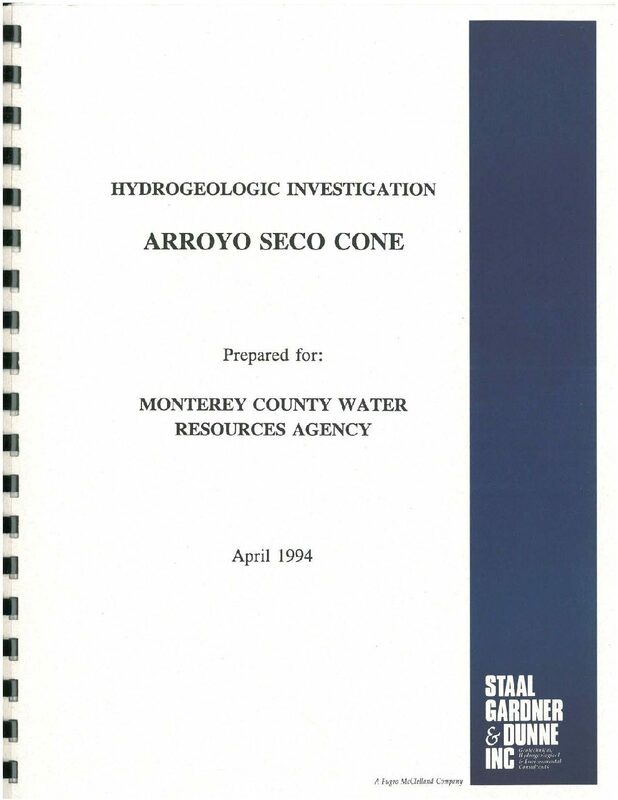 This case study highlights four of these projects, covering almost a century of MAR and water security in California. 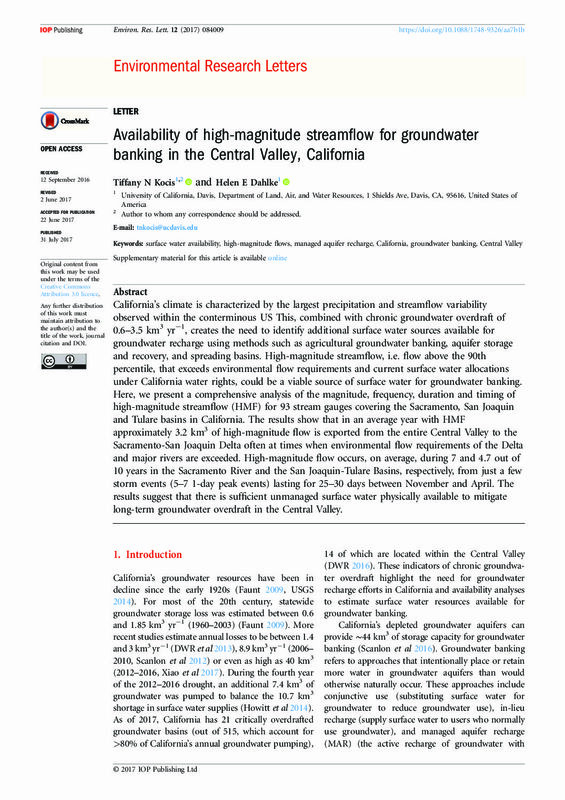 Managed aquifer recharge is used to augment natural recharge to aquifers. It can be used to replenish aquifers depleted by pumping or to store water during wetter years for withdrawal during drier years. Infiltration from ponds is a commonly used, inexpensive approach for managed aquifer recharge. At some managed aquifer recharge sites, the time when infiltrated water arrives at the water table is not always clearly shown by water-level data (fig. 1). 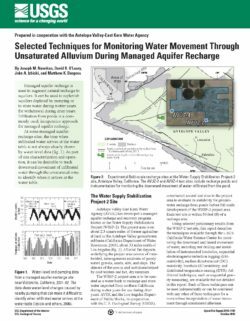 As part of site characterization and operation, it can be desirable to track downward movement of infiltrated water through the unsaturated zone to identify when it arrives at the water table. 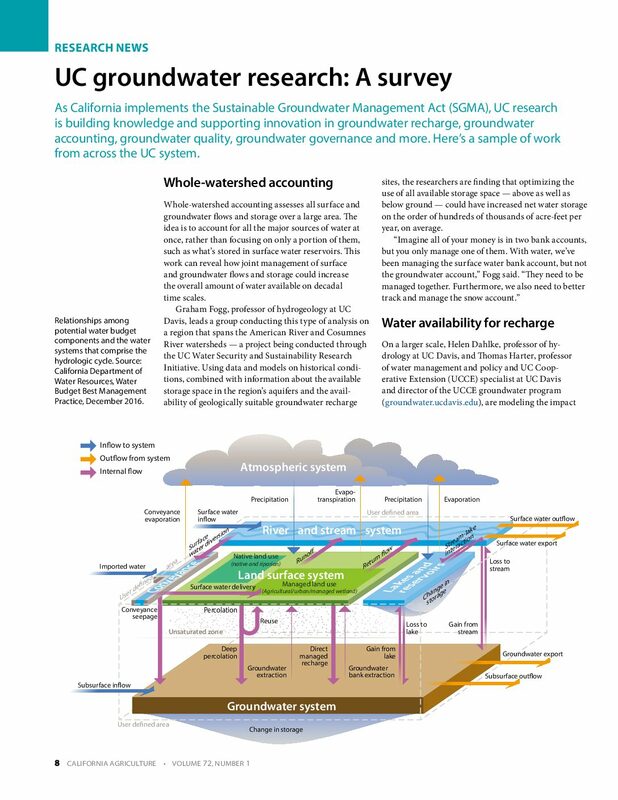 As California implements the Sustainable Groundwater Management Act (SGMA), UC research is building knowledge and supporting innovation in groundwater recharge, groundwater accounting, groundwater quality, groundwater governance and more. 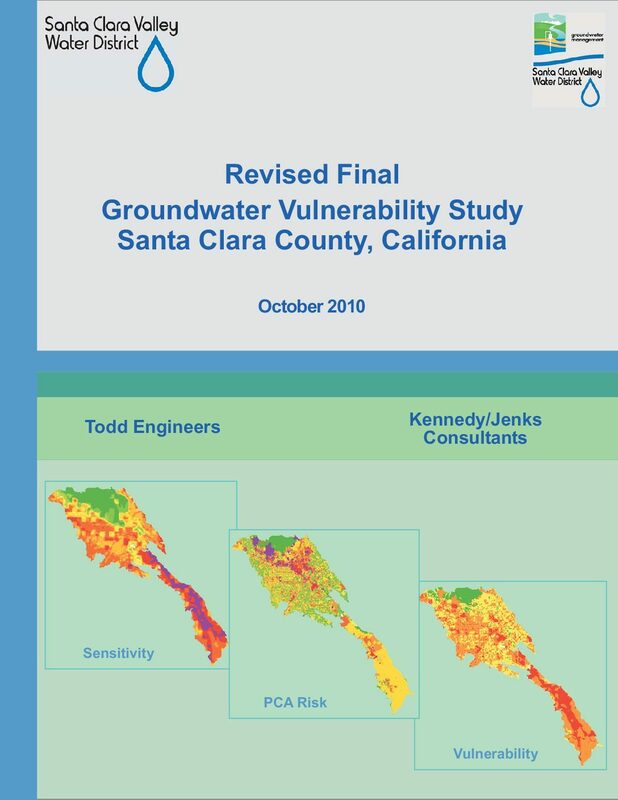 Here's a sample of work from across the UC system: whole watershed accounting; water availability for recharge; precision data on snowmelt; spatial data on well vulnerability; large scale groundwater recharge and agricultural systems; groundwater-surface water interactions; groundwater quality and salinity; water supply, land use and rural communities; data on water use and water rights; managed aquifer recharge on farmland; soil suitability for recharge; distributed stormwater collection; net metering for groundwater; geophysical imaging; groundwater governance; lessons on groundwater permitting from around the West; supporting Groundwater Sustainability Plan development; the economics of sustainable groundwater management; and considerations for groundwater markets.